On the way down the main hall again I found the funny little 750-c.c. Moretti Coupé, an example of which had been competing at Montlhery the previous day. In addition there was a much nicer looking 1,200-c.c. 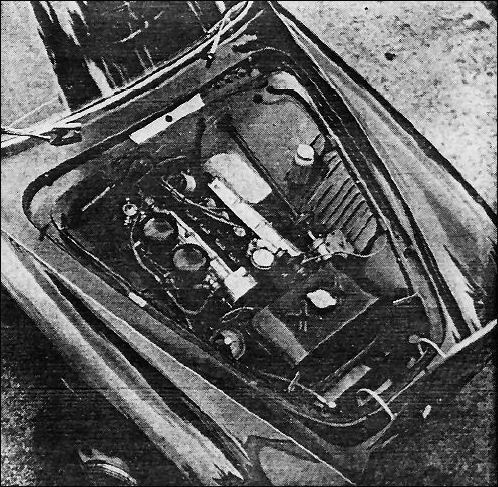 version with a Coupé body, both cars being four-cylinder twin-overhead camshaft models with very light tubular chassis. 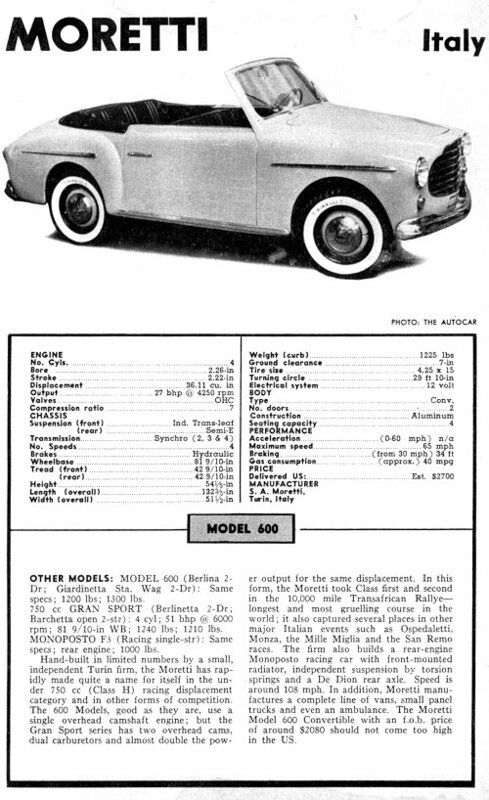 In Italy there are numerous builders of these little limited-production " specials," such as Stanguellini, Bandini, Giannini and Ermini, but Moretti are the only ones who managed to get out of their own country. Transferred on the back window of the 1,200 Moretti was a rather delightful notice saying, in French, " En Rondage " and underneath, in English, " Grinding of the Cylinders," which is one way of looking at running-in. THE Moretti 750 Grand Sport Berlinetta Coupé by Ghia is the complete for the smallest car we have ever tested. 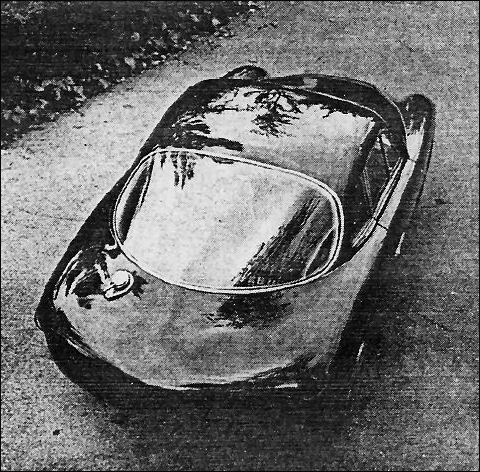 But whether you call the Moretti by its full name or by its inevitable nickname, the “Baby Ferrari,” it is a car that demands end gets respect. The Moretti Coupé is not	comparable in any way with the other three cars	road tested this month. It is smaller, lighter, faster and better looking than the others-and cots more than twice as much. It also rides harder, corners faster and accelerates more quickly than the other three. In short, although the factory says this is not a competition sports car, it is just that. A fair idea of the sensation the car creates wherever it goes can be gathered from photographer Rolofson's experience. He drove it down to the automotive styling building at the Los Angles Art Center School, blipped the throttle twice, got out and ran up to a second story balcony for some shots. Within less time than it takes the car to accelerate to 90 mph, the car was obliterated by swarming students! After one gets over the sheer audacity of this diminutive Coupé, the real surprise is in driving it. Getting in is not easy and there is no need (or possibility) of wearing a hat. But once inside there is really ample space in all directions, thanks to the very low bucket-type seats. The starter rasps like a Fiat and the 748 cc. engine bellows with a resounding rap. The clutch has a very short travel but will engage smoothly or with a solid bite as desired. Once under-way the engine seems fairly quiet even if the transmission gears are not. For a double overhead camshaft engine of its size, the performance is astounding. We didn't believe the speedometer at all, but later found that it was not fast, but slow. We drove it in heavy traffic for over an hour with no difficulty. It will idle along in high gear at 15 mph and accelerate away smoothly and briskly. Yet this is the same engine that later tuned 7000 rpm in each gear time after time during our performance testing procedure. runs was Jack McAfee, who is not only a top sports car pilot butalso a damn	good mechanic. Alter burning up two sets of spark plugs, due to the leaning out at high speeds, we gave up on top speed runs. We all think the car will top the 100 mark, especially since this. car had less than 200 miles on it, at the time. In examining the acceleration figures and graph it should be borne in mind that these figures were obtained with an accurately calibrated speedometer from an engine of only ¾ of a litre in displacement and carrying 350 lbs of crew and test equipment. Two standing ¼ mile runs in 20.0 seconds dead is a figure that requires at least 4 litres of engine to beat in the clutchless variety of car and the speed of 69 mph at the finish was not made with a drag strip "rolling 30 mph" type of start. Another indication of the performance of the Moretti is the Tapley reading in first gear. Only a handful of cars will spin the dial "off-scale" at over 600 lbs/ton. The Moretti recorded 500 lbs/ton at 20 mph. The Tapley meter did bring out a minor fault in the car which might otherwise have gone unnoticed. In third gear for example we got several readings which averaged 265 lbs/ton at 30 mph. We thought this was the best reading at the lowest speed but further checking showed that readings fell-off slightly at 35 to 40 mph and than picked again to 280 at 45 mph. This indicates that the torque curve is not the usual flat or convex shape but actually has a "hole" or drop-off between 3200 and 4000 rpm, approximately. This is usually a sign of faulty carburetion or manifolding. It also indicates that the torque peak is very close to 4500 rpm. The Tapley coasting reading of 95 lbs/ton at 60 mph appears high, but the test weight of 1470 lbs. is only .733 tons, so the sum of wind and rolling resistance drag forces is actually only 70 lbs (.735 x 9.5). 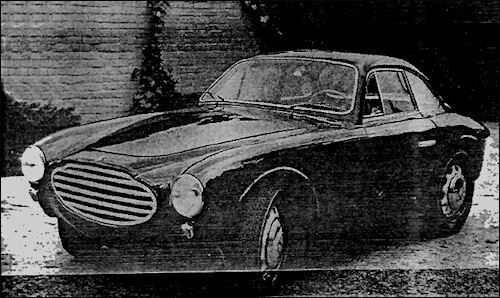 This is of course the lowest drag factor we have ever reCorded and adds credence to the earlier claim that the Moretti Coupé should be capable of 100 mph. The riding and handling qualities of the car were somewhat disappointing. There is no denying that a hard seat, a stiff suspension and small tires produce a spanking effect that gets rather tiresome after 100 miles or so. Examination of the seat proved that it would be a simple matter to make-up a large square drop-pan under each seat in order to	cushion depth. This would be tremendous improvement over sitting on leather covered board (almost) and the flat cornering would be much more appreciated. The steering	itself seemed good at high speeds (2.8 turns lock to lock) but was marred by tire unbalance. At low speeds it takes	too much concentration to hold a straight line, but judging from the tire wear after 320 miles of testing, a wheel alignment was needed. The brakes gave no trouble and the 10.5 inch aluminum drums certainly appear to be adequate. The Ghia body is beautifully finished particularly on the outside There's nothing wrong with the interior except its a little plain in comparison with more expensive models from this firm. The spring-spoked steering wheel is first class and the instrument layout is complete with 8000 rpm tachometer (Recommended rev limit 7000 rpm). The plexiglass side and rear windows are fixed and ventilation could be improved-there is none. Interior noise level is up to modern standards but was better than the average Ferrari Coupé. Summed up, the Moretti Coupé is one of the most appealing automobiles we've ever seen or driven. Its few faults could easily be corrected by any enthusiast-owner and the price is reasonable for a custom bodied machine that can go out and bring home a class H win at any sports car event you can name. Finally we want to thank the car's owner Harry Jones for letting us carry out a this full-scale road test. It is a rare thing to find such enthusiasm and confidence in a brand new car-rarer still to find someone who will say OK on only an hour's notice. If it only had Borrani wire wheels.